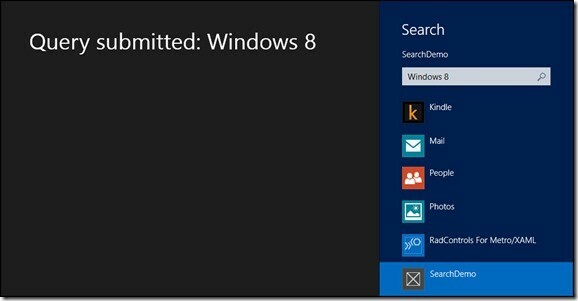 Windows 8 Store Applications can take advantage of the shared “Charms” that you see when you swipe in from the right edge of your Windows 8 device (or press Win-C). The top charm is searching and it provides tremendous functionality at relatively little programming effort. When you click search Windows 8 assumes you want to search the current application if that application has registered a Search “contract.” If it has not, Windows 8 will assume you want to search the applications, as shown in the figure (click on the figure for full size). In any case, every program that implements a search contract will be listed and the user is free to choose a different application to search. In the image above, for example, we can see that Store, Bing, Finance, Games and so forth are all searchable. In this first blog post on searching, we’ll build the simplest application we can to register as a Searchable application and to receive the search query. We won’t do anything with that query except display it, but this alone will demonstrate a great deal about implementing searching. 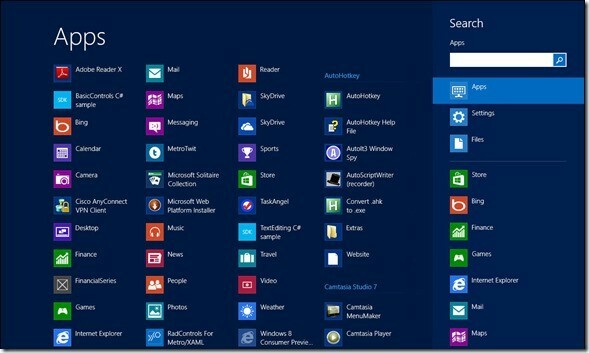 Note, this application was created by stripping down the excellent example program provided by Microsoft as part of the SDK samples. // navigate to landing page. This last method will ensure that if your application is called through a query and it is not running, it will open properly and behave as expected. 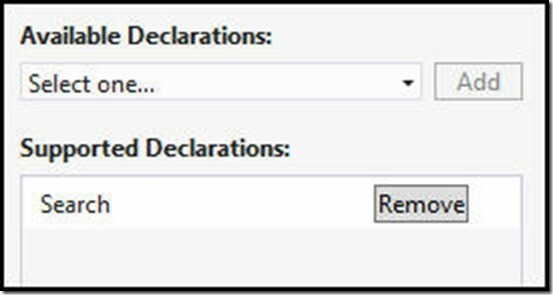 This entry was posted in Contracts, Essentials, Metro, Mini-Tutorial, Windows 8, WinRT, XAML and tagged Mini-Tutorial. Bookmark the permalink. The XAML remains the same. The Click Event would look like this Private Sub RadioButton_Click_1(sender As Object, e As RoutedEventArgs) Dim radBtn = TryCast(sender, RadioButton) If radBtn IsNot Nothing Then Dim index As Integer = Convert.ToInt32(radBtn.Tag) _flipVw.SelectedIndex = index End If End SubThat’s it.. Thanks for the coemnmt.